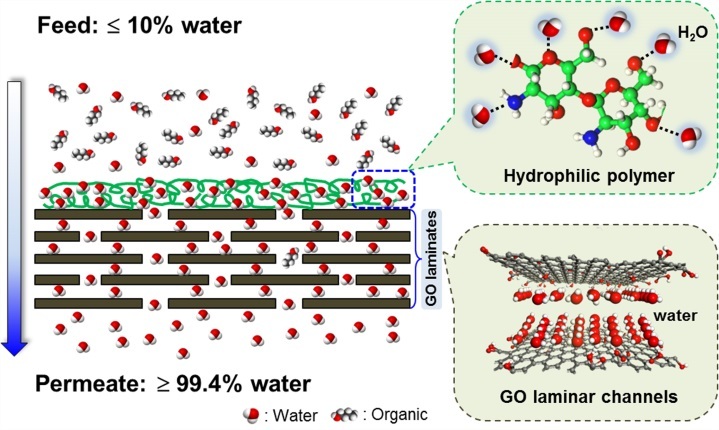 Recently, Prof. Jin’s group published a new paper “High-Efficiency Water-Transport Channels using the Synergistic Effect of a Hydrophilic Polymer and Graphene Oxide Laminates” in Advanced Functional Materials (DOI: 10.1002/adfm.201502205, http://dx.doi.org/10.1002/adfm.201502205). In this work, we designed a bio-inspired membrane that couples an ultra-thin surface water-capturing polymeric layer (< 10 nm) and GO laminates. The proposed synergistic effect of highly enhanced water sorption from the polymeric layer and molecular channels from the GO laminates realized fast and selective water transport through the integrated membrane. The as-prepared membrane exhibited highly selective water permeation with an excellent water flux of over 10,000 g/m2 h, which breaks the performance upper bound of state-of-the-art membranes for butanol dehydration.